This section describes contract defences, some of the basic grounds in common law and statute law that can help a party get out of a contract. Client did not understand the contract they were signing. Client was “forced” into signing a contract. Client signed a contract, but says they were misled about the extent of their liability. This section covers defences only. Defences are the grounds upon which a consumer can defend a legal action by someone seeking to enforce a contract. This is different from a “cause of action”, which is a consumer’s right to bring a legal action themselves. In some instances, some legal principles can be both defences and causes of action, depending on who is bringing the action. For example, if a consumer refuses to make payments called for in a contract, they may be able to make a defence on the grounds of unconscionability (see below). If the consumer has already paid for the goods or services, they could also use the grounds of unconscionability to bring a legal action (or “cause of action”). It is important to note the distinction between defences to liability and defences to amount, or quantum. Liability refers to the court finding someone responsible for an action or debt. If a consumer can assert no defence in an action by a creditor, the consumer is liable (or responsible) for that debt. If a consumer has paid for a defective product and gets their money back through legal action, the seller is liable for damages (the amount of money to be refunded). If the court decides that one party should pay something to the other, the court must also decide how much should be paid. The legal term for the amount to be paid is “quantum”. Often, the amount is obvious. For example, if the consumer is liable, the creditor can usually prove the amount of the debt. If the court decides that the consumer is entitled to a refund, the amount also ought to be obvious. Whether the debtor has been properly credited for all payments made. Whether the amount of interest claimed by the creditor is correct. This is a particularly complicated area where courts often have to decide whether a full or only partial refund should be awarded. In general, the plaintiff (the party seeking a remedy) must prove their case by presenting evidence to persuade a judge that they are entitled to the remedy. If the plaintiff is a creditor, the creditor must prove that the debtor owes the debt. If the plaintiff is a consumer, they must prove that the product they bought was defective. The obligation on plaintiffs to prove their case means defendants need only indicate that they do not admit to the plaintiff’s claim. Defendants can do this by filing a reply in the case of Small Claims Court actions, or by filing a response in Supreme Court actions. They may not bother to show up at court, thinking that it is not worth their time or that they may lose. They may not have the proper evidence, such as witnesses or documents. They may not be credible and so lose by not proving their case on the balance of probabilities (the likelihood that one party’s evidence is more likely to be accurate than the other’s). They may run afoul of some rule of evidence that does not allow them to admit evidence crucial to proving the case. Gambling debts: Historically considered uncollectable and illegal, court decisions suggest they are now collectable. Illegally paid interest: Although it is illegal under the Criminal Code to lend or collect interest at an annual rate above 60% (except as authorized under payday loan legislation), in at least some instances the courts have allowed the recovery of the illegally paid interest. If a person makes a false statement to induce someone to enter a contract, the deceived party may be entitled to a remedy in court on the basis of misrepresentation. Historically, the courts have awarded different types of remedies, depending on the nature of the misrepresentation. For example, they may let the deceived party out of a contract completely or give the person partial compensation through a damages award. To some extent, common law principles of misrepresentation have been overtaken by related defences for deceptive acts or practices that apply to a wide range of consumer and credit transactions under the provisions of the Business Practices and Consumer Protection Act. “Mistake” refers to a basic, or fundamental, misapprehension or misunderstanding between the parties to a contract. For example, the parties might be mistaken about who the contracting parties are, the subject matter of the contract, or the nature of the contract itself. In common law, a contract based on a fundamental mistake is void — that is, ineffective for all purposes and at all times. Neither side can enforce the agreement. This has often resulted in hardship for one or both sides. Recent findings tend to favour the concept of a contract being “voidable” as opposed to a contract being void. Voidability allows a court to terminate the contract, but gives partial compensation to one party. In most standard credit and consumer contracts, this concept of fundamental mistake seldom arises. Although clients may complain that they did not understand the papers they were signing, a perfect understanding of all the terms of a contract is not necessary to make it binding, as long as clients grasp the basic terms of the contract. In general, courts look at the reasonableness of the mistake and the behaviour of the parties when deciding whether to enforce a contract. If one party clearly did not bother to read some of the “fine print” of a contract when they had the opportunity to do so, a court may not be sympathetic to an argument based on a mistake. However, if one of the parties knows about the mistake and does not reveal that knowledge, the courts may let the mistaken party out of the contract. 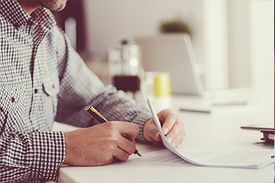 In recent years, courts have decided that consumers may be relieved from the strictness of some written contract terms if they find it is the duty of the business to draw a specific term to the consumer’s attention. In Tilden Rent-A-Car v. Clendenning, for example, it was not that the consumer was mistaken about the terms of the contract, but that the consumer was unaware of a “fine print” term that had an unfair effect on the relationship between the parties. Unconscionability: A contract is said to be unconscionable if a stronger party uses power to gain an unfair advantage over a weaker one. Inequality between the parties created by one party’s ignorance, need or distress can result in substantial unfairness in the overall bargain; for example, with one party setting an inordinately high or low price. Notable BC cases on unconscionability are Morrison v. Coast Finance Ltd. and Waters v. Sun Route Tours Inc. Under duress: External coercion or compulsion exerted by one party against another can result in a contract being made under duress or force. Compulsion may be physical, psychological or economic. The most obvious example of duress is if one party is threatened with physical harm unless they enter into an agreement. Undue influence: Undue influence is when one party uses the other party’s confidence in them to gain an advantage. The confidence may arise from the nature of the relationship, such as between members of a family, or between professionals and their clients. This section provides only a brief overview of some of the more important defences available in consumer and debtor transactions. Take care when raising a defence during negotiations with a seller or creditor. While there is a range of possible defences, they are rarely successful in court. In general, you should consult a lawyer if the issue of a defence arises. This page was last edited on 11 October 2018, at 05:25.